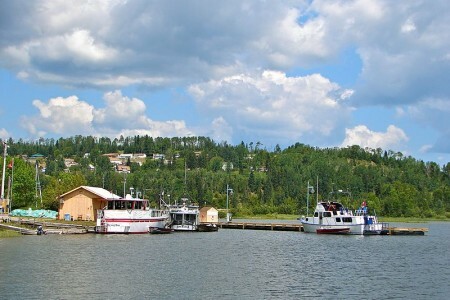 Towns in the westernmost part of Highway 11, from Rainy River on the U.S. border going east to Nipigon. 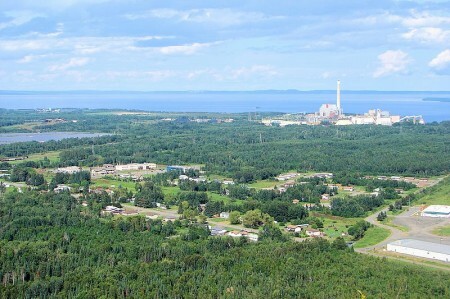 A former forestry and mill town of approximately 1000 people, Red Rock is about nine kilometres miles from Highway 11. I didn’t venture off the highway but Red Rock known for wonderful views of the local cliffs, as well as for continuing the proud Highway 11 tradition of summer musical festivals – Red Rock hosts the annual Live from the Rock Folk Festival which takes place the second week of August. The town also hosts an annual mountain run. The town also features a beachfront, marina, and boardwalk – just turn south at the abandoned tavern. The Red Rock Inn provides accommodation in town. As I went through the site to reformat and redo it after losing all of my content in early 2013 (thank you, wonderful internet! ), I collapsed a number of tiny entries into single pages. Mainly to save website space and to improve the viewer’s navigation experience – anything in the name of efficiency. But there is one town whose page I refuse to combine with any other: Hurkett. Because if I did, I might find a price on my head. OK, more likely I’d get inundadted with nasty emails…but more on that later. Hurkett is actually three kilometres south of Highway 11. At first glace, I thought that there wasn’t much there. I counted about three houses near the highway, and another three further in. In all it was a five minute detour. So I posted these impressions online, and promptly started developing a really bad reputation with the local population. Is there more to Hurkett than this? One resident sent an email incensed that I had gotten things so wrong about her community. One particularly memorable email stated that us southerners (they assumed) just couldn’t give a crap about the north (they assumed), and that I wouldn’t know a nice town if it smacked me in the head and if I had any eyes, ears, or brains at all (did they assume I had any? Or that I didn’t have any? I will assume that they assumed the latter) well then I’d have seen this wonderful little community, but because I come from Toronto (they assumed), a place where people are shot on the street on a daily basis, then I must be another half-wit southerner (they assumed) who should just stay the heck out of the north. Wow. However, there were also some much more reasonable emails from Hurkettians (sp?) informing that I had, indeed, misrepresented their community. Dawn emailed me to tell me that I had, once again gotten things wrong. It turns out that Hurkett is community of approximately 100 households (not 6!) and 300 people just off the Highway. My apologies to the poeple of Hurkett for missing the essence of their community. Dale emailed to tell me that Hurkett has a nice public dock on Black Bay where you can fish (there is a local fly fishing company in town.) 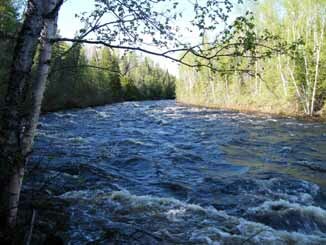 There is a community centre, a fire station, an arena that was volunteer-built (like Iroquois Falls), and nearby is the Hurkett Cove Conservation Area. On my quick drive through, the things I noticed were a wetland, a strawberry farm, a tree nursery, and a “walk-in cooler for all your cold storage needs.” I’m hoping to add to this with more about Hurkett’s past and present, if I can. Email me at info (at) highway11 (dot) ca. Thanks to Dale and Dawn for the info on Hurkett, and my apologies to the other Hurkettites (sp?) that I offended with my earlier profile of Hurkett. Lesson #1 – Always keep your keys in your pocket – lest you get locked out in the middle of nowhere. Lesson #2 – Always follow the map – lest you get lost in the middle of nowhere. Lesson #3 – Maps always lie. Although my provincial highway map seems to suggest others, once again Pass Lake isn’t on Highway 11. It has a gas station and a few homes on the highway, but the town is five kilometres south of the highway, towards Sleeping Giant Provincial Park. 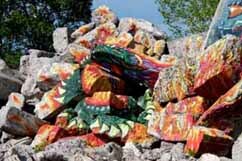 Pass Lake has two interesting aspects to its history. 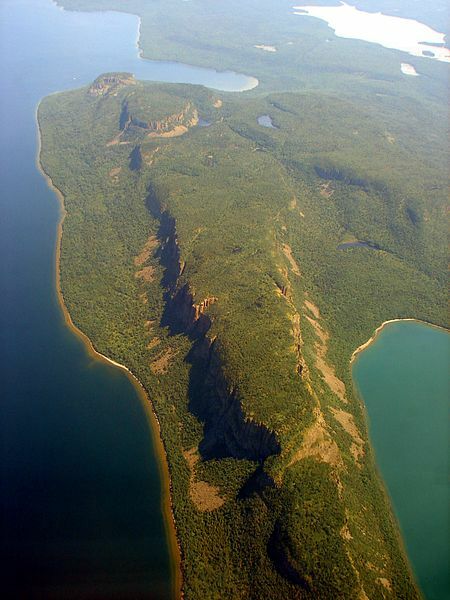 First, the area was first populated by the Aqua-Plano Aboriginals 9000 years ago. The Aqua-Plano built a society around the hunting of large game animals, building specialized tools to prolong their existence. Second, the area was the site of a special settlement of Danish homesteaders during the Great Depression. It was hard for Danes to own land at home, some they came to Canada, cleared the land, built a settlement, and in 1932 erected Salem Lutheran Church, which still stands today. A quick scan of local mailboxes showed names like Hansen, Salem, Sorensen, and Riemer, showing that descendants of original settlers remain to this day. A local resident obviously wouldn’t let a bad acronym get in the way either her own name or the joys of alliteration – Kathy’s Karen’s Kountry Kitchen serves home cooked meals on what must be one of Ontario’s most serene patios. There is a beach at the lake with some cottage and camping facilities. Beyond that, the town was hard to find. There was an arrow for a community centre, but it looked to be far into the bush on a red dirt road. The houses are spaced out and there is no focus to the town. 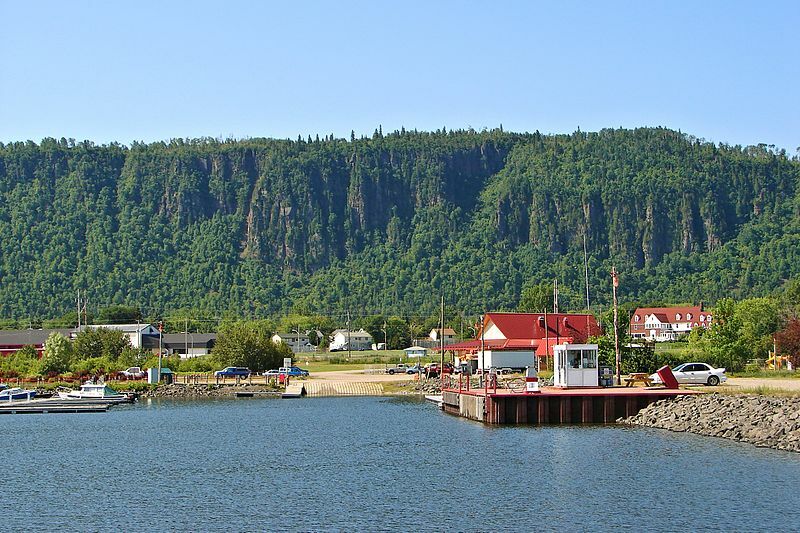 Pass Lake hosts an annual fall fair and offers some great views of Sleeping Giant Provincial Park, which is approximately 25 kilometres further down the peninsula from the town. Wild Goose isn’t actually on Highway 11. It’s about five minutes south of it on Lakeshore Drive in the Township of Shuniah, which was the first municipality founded in northwestern Ontario. Shuniah is a local aboriginal word for silver, which was mined in the area. I stayed in a great hostel here – the Thunder Bay International Hostel. For $20 a night you get your own room. Camping is even cheaper. Hiking and the river are nearby. Lloyd and Willa and great hosts, and Lloyd knows all the best spots for swimming. I never went swimming. I hope I didn’t disappoint. 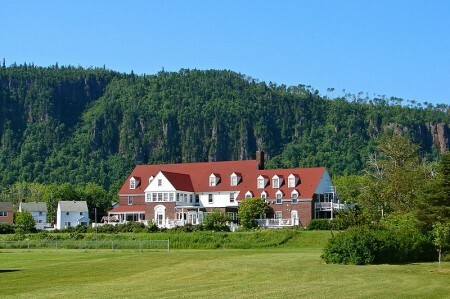 Wild Goose has a nice park where you can swim across from the ever-present Sleeping Giant. There is an LCBO outlet and a variety store. Silver Harbour Conservation Area is a two minute drive from Lakeshore Road. Thunder Bay has a big random curling rock statue? A massive four city-block-long woodpile? Statues of arctic animals that live nowhere nearby? Thunder Bay may be the big city but we’re still in northern Ontario. I once heard a pretty prominent Canadian comedian joke something to the effect that there’s a reason that the Marathon of Hope ended in Thunder Bay. I never really got the joke. Maybe it’s because the city’s initials stand for a deadly disease, but I haven’t figured out what he was talking about. I like Thunder Bay. The TB DMZ. Keeping hostilities between Port Arthur and Fort William to a minimum since 1907. 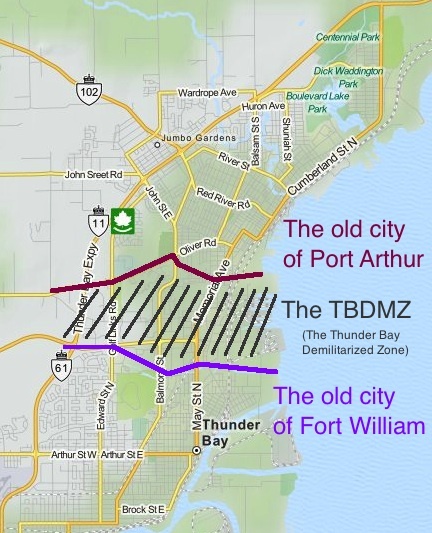 Thunder Bay is actually two cities – Port Arthur and Fort William amalgamated in 1970. Since then, they really haven’t come together in a physical manner. There is a bit of a ‘no man’s land’ between north and south Thunder Bay, filled with a golf course, a hospital, an expressway, and some suburban-style office parks. The street names change between north and south. So how did they choose the name “Thunder Bay”? I have no idea if this is true, but I once read in a book that when Port Arthur and Fort William merged in 1970, they couldn’t decide on a common name. In order to solve the problem, they held a referendum. As always, the voters were split. Some thought it should be named “Lakehead.” While others preferred the more regal-sounding “The Lakehead.” When the final tallies were counted, the two Lakehead options combined had a majority of votes. However, with the two camps splitting most of the vote, plucky little “Thunder Bay” slipped up the middle to win a plurality. Is it true? I don’t know, but I wouldn’t be surprised. My first car had only AM radio. Which means only oldies music. Which means you hear a lot of Thunder Bay’s Bobby Curtola so the station can be in compliance with CanCon requirements. Thunder Bay has a lot of variety in neighbourhoods. Many parts are littered with old northern hotels and taverns (a la Timmins), while some residential areas have stately turn-of-the-century homes (a la Haileybury), while there are the 1960s suburbs (a la Etobicoke, but with bigger lawns), while Walsh Street is essentially a paved hydro corridor with homes on either side (a la Longlac.) The whole situation means that, while Thunder Bay is a really nice city, it can be sprawly, confusing, and makes for horrible driving. Of course, nothing says ‘Thunder Bay’ to the history-conscious Canadian than grain elevators. The prevalence of shipping means that the city is criss-crossed by train tracks, which pretty much cut off the city from most of its waterfront, save for a nice park in the north. I think that the port in south Thunder Bay is bigger, but that the elevators in north Thunder Bay are near the waterfront park and therefore make for nicer photos. 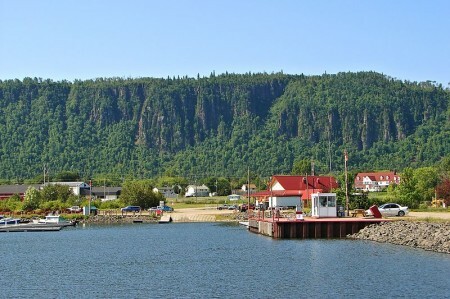 There are beautiful views of Sleeping Giant (the big rock formation off the harbour) from both the waterfront marina park or from Hillcrest Park on High Street. One of the coolest thing about Thunder Bay is the massive rock-bubble-things that border the south part of town. You can’t miss them no matter where you look to the south. They’re called the Nor’Westers (after the fur traders) and the largest (Mount McKay) is open for cars to drive up, for a small fee. There’s something Rio de Janeiro-esque about it – they just need a statue on top, looking down over the city. Maybe they can put a statue of a famous Thunder Bayer up there. Again though, who to choose – Port Arthur’s Bobby Curtola or Fort William’s Paul Shaffer? I’ll pledge 50$ to that. Thunder Bay: The North’s New York City…? But nothing shows off Thunder Bay’s cosmopolitan flair better than its International Friendship Garden. The Thunder Bay Soroptimist International Friendship Garden – featuring installations from the Chinese, Dutch and Croatian communities. However, you have to give TB some credit here. It’s actually pretty cool and totally endearing. Most cities couldn’t have attempted this. Fewer would have even considered it. It’s more than a bit hokey, but that’s what makes it undeniably charming. Sure, the Confucius statue and adjacent mini-pavilion looks like it could be beside Chinese restaurant in Markham, but who cares? It’s a great park and apparently one of the ‘in’ spots for wedding photos in Thunder Bay. If you’re in Thunder Bay, you need to try a Persian. A Persian is a holeless doughnut rubbed with cinnamon and topped with a bright pink sugary raspberry glaze. They were …ahem…”invented” in Thunder Bay (in the 1930s), perfected in Thunder Bay, and only sold in Thunder Bay. A Persian is like the oil-soaked goodness of a fresh farmer’s market doughnut and and the sugaryness of a Beavertail all rolled up into one bundle of super fatty northern Ontario goodness. As one of my co-workers has told me, she works with people in Thunder Bay and when she asks them about Persians, she could practically hear their mouths water through the phone. When she goes there for meetings, she buys two flats and brings them back from Thunder Bay on the plane, and only one flat makes it back alive. But if you’re gonna take the plunge – make sure you avoid the chocolate and go for the real thing – the one with the pink topping. 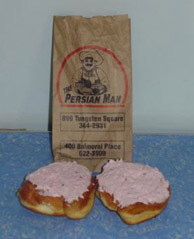 Persians – unique to TBay, tho eerily similar to the Paczkis of Cleveland or the doughnuts of pretty much anywhere else. There are two locations that sell Persians (the doughnuts – not the ancient peoples) – one on Tungsten (out by the university), and one on Balmoral. Just look for The Persian Man. For non-doughnut grub and shopping the major streets are Red River and Memorial in north Thunder Bay, and Arthur in south Thunder Bay. There is a real mall, a movie complex, the only Swiss Chalet since North Bay, some other chain restaurants, but no Giant Tiger (disappointing.). 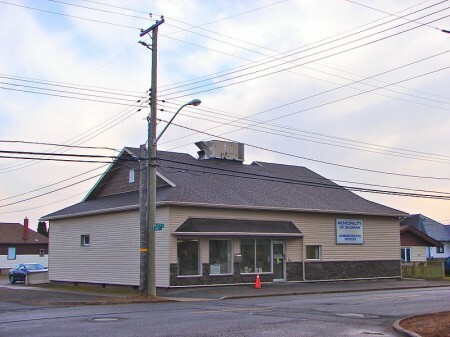 At one time, TBay had the only East Side Mario’s since Timmins but Keith emailed me to deliver the bad news – it is closed. As far as culture, the Thunder Bay Art Gallery on the campus of Confederation College had a great Norval Morrisseau exhibition while I was there. The gallery is small, but entrance is ridiculously cheap. Thunder Bay also has a symphony, as well as a charity casino. The corner of Algoma and Bay in north Thunder Bay is a bit of a hip spot, with some pubs, a hostel, and specialty shops nearby (a Finnish-language bookstore, and Finn-tastic Sauna and Gift Shop). While I was there, an Italian festival had blocked off the intersection (beer tent + meatball & sausage stands + old nonnas telling you to eat more = my kind of thing!) There’s also a really nice ballpark in Port Arthur that hosts The Thunder Bay Border Cats, a minor league team in one of the American independent leagues. 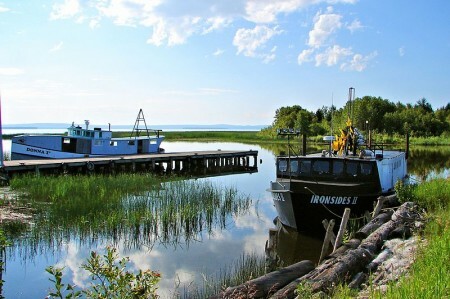 But as soon as you get start getting visions of grandeur, Thunder Bay returns to its northern roots. There are all-you-can-eat cabbage rolls and pirogi every Friday from 12-1 at the Polish Hall on Algoma. The Superior Bowladrome is one of four bowling alleys I counted in TB. But for a real Thunder Bay meal, you need to go to the Hoito. It’s a diner serving traditional Finnish food, and in its heyday it was a focal point for the very politically-active Finnish community. There’s even been a book written on stories told in the diner. It’s located in the old Finnish Labour Temple, which the local community is working hard to restore. Finally, you know Thunder Bay is a true northern town as it obeys the two main laws of Highway 11 – that each city must have something big, and something in a pile. Thunder Bay has both – its five-foot tall curling rock, and the ever-popular pile of wood. 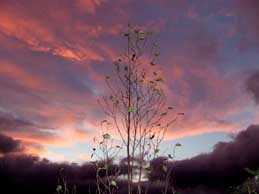 I had the idea to blog all of Highway 11 / Yonge Street when I was eight hours into a drive from Timmins to Thunder Bay. I had been working up in the Timmins area and figured why not use the civic holiday weekend to drive out to Thunder Bay. (I figured I’d never be so “close” by again.) I had just left Geraldton when I saw a young hitchiker walking west in the middle of one of those storms where the rain falls at just the right diagonal angle that you wonder if it’ll take the paint off your house. It was hitting him so hard that it was knocking his baseball cap around on his head. “Boy,” I thought. “I bet this guy had wished he’d read up about this stretch of highway.” It’s a good 70 km to Beardmore. And then I lightbulb went off. After having a bit of a scare of my own – I would have left Iroquois Falls for Timmins via backroads in the winter with next to no gas, only to be dissuaded by a pleading co-worker. “There’ll be a gas station”, I thought! 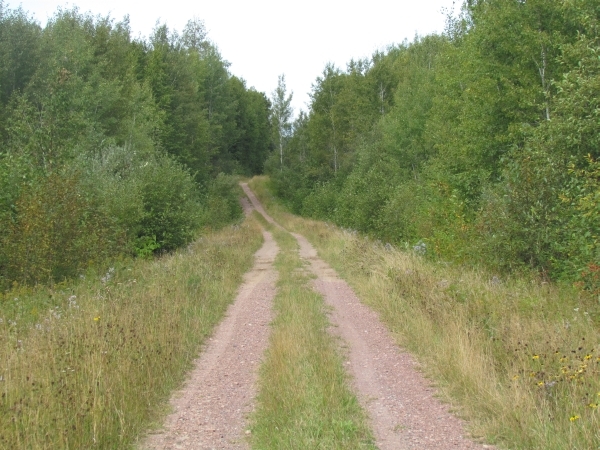 – I’d been blogging about some of the towns in and around Timmins and northern Temiskaming. They’re all around Highway 11. And Highway 11 is Yonge Street. Why not just turn this into a blog on the world’s longest street? I had arrived in Thunder Bay feeling triumphant, happy to see the city lights as a signal – that I had done it. I felt like I had practically finished the Boston Marathon or something. Except in my car. The problem with that thought, however, was again my lack of planning. At that time, I had thought that Highway 11 ended in Thunder Bay. I wasn’t even truly aware that the Highway kept going. But then I kept following Highway 11 further. And further. And then in Kakabeka Falls, I finally figured it out. Highway 11 kept going. All the way to Atikokan. To Fort Frances. To Rainy River. I hadn’t completed it by any means. I was more than 500 km short! Sometimes called “Niagara of the North” (when Bracebridge isn’t calling their rather middling falls the same thing), the town of Kakabeka Falls is built around the waterfalls from which it derives its name. Thirty kilometres west of Thunder Bay, Kakabeka Falls is one of Ontario’s natural wonders. The Metropolitan Moose is a good bet for baked goods and coffee, and if you’re feeling adventurous, you can try to Chinese food available at the curling club just east of town, although I don’t know if it is quality Northern Ontario Chinese Food. The town has a four to five motels, an LCBO outlet, gas stations, two amethyst shops (the amethyst signs are really getting old, they’re even on people’s front lawns out here.) 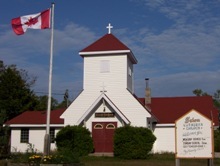 There are two churches in town, including St. Theresa’s which is pictured here. Wednesday night is bingo night at the Legion. There are about 6000 people in Kakabeka Falls and Rosslyn Village altogether.